My daughter and I walked along a microscopic section of the Appalachian Trail back in the spring. Because our time was limited and my legs were weak we couldn't go much of a distance. The two of us walked far enough to get a good view of the surrounding mountains and came back. She and I were on the trail long enough to get my curiosity going. 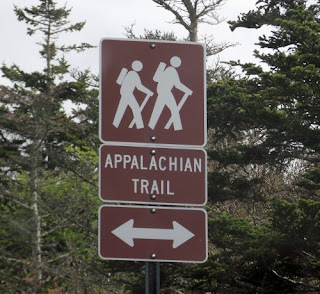 I've seen the signs here and there but didn't know much about the Appalachian Trail. 1. It is not the longest trail in the U.S.
That designation belongs to the Pacific Crest trail. 2. The Appalachian Trail goes through eight national forests. It also travels through two national parks. What I didn't know is that some of the trail is on private property. 3. The AT does not end in Maine. A segment called the International Appalachia Trail (IAT) continues beyond the U.S. and goes into Canada. It is through this section that hikers will face some some of the most remote stretches of the trail. Food must be carried for greater distances. 4.Spinoff trails are being developed in Europe. 5. There is an estimated number of 4 million people a year who enjoy the Appalachian Trail. Many of the people who use the trail walk only a small part of it. However, there are a handful of people each year who hike the AT from start to finish.